Kids parties are one special occasion for kids to enjoy and surprisingly, for adults as well. Kids parties bring in a number of participants which kids may play and learn camaraderie among other kids. This specific event and activity also bring families together as sort of a bonding experience. 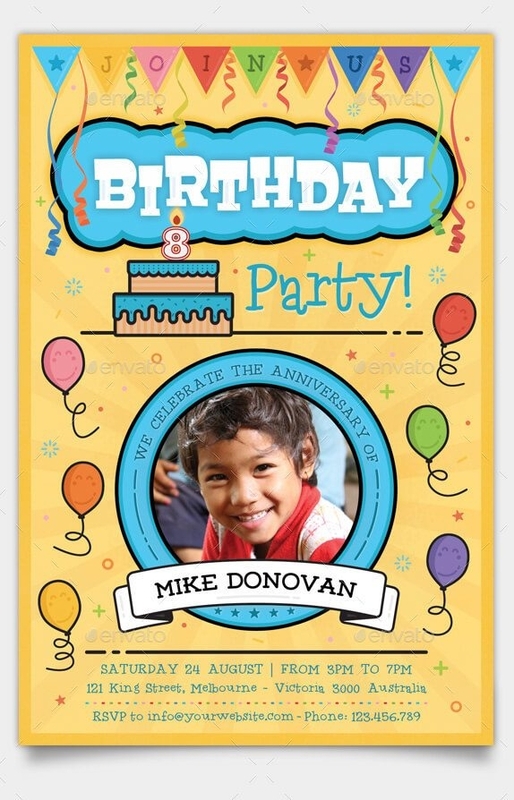 If you are considering in throwing one kid’s party, make sure to invite potential guests with the use of beautifully designed and informative party flyers. In our list down below, we have gathered a heap of kids party flyer designs. All of which are provided in a downloadable format. You may also view our guide to the making of promotional flyers. The latter focuses on the technical details in crafting such promotional material. A Collection of Kid’s Party Flyer Designs. Kids flyers mostly receive a playful and fun design treatment perfect for its younger demographic. The commonly used design elements incorporated into the aforementioned are cartoon character designs, bright pops of color and simple layout which allows the designs to be the highlighted and creates the overall art direction of the design. Though kids party flyers are dedicated to the younger demographic, the main target audience is the adults or parents. Since the latter are the ones who’ll accompany the younger ones to these types of events. In this case, party flyer designs should incorporate design elements that are aesthetically pleasing and evokes excitement to the kids and allows the older demographic to process the content being presented on the medium. For a more extensive design selection, we have prepared an assortment of travel flyer designs. Which will be of great help when utilized as promotional materials and for future design resources. In our selection of Kids Party Flyer Designs. 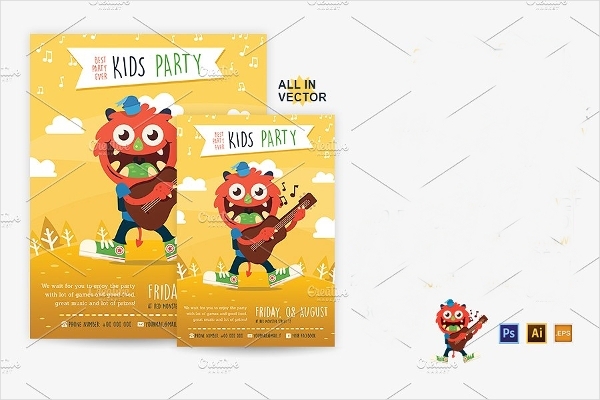 To help you get by in your selection for kids party flyers Designs, we have explained the following kid’s party flyer designs to which you may consider utilizing. 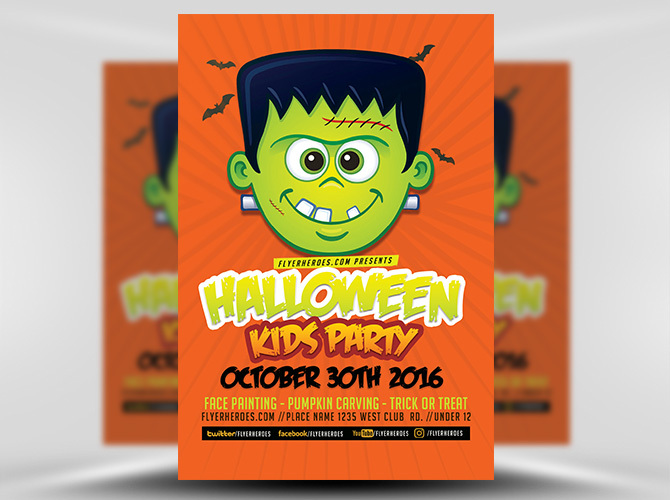 First on our list is the Halloween Kid’s Party Flyer Template which incorporates a dominant placement of graphics. It best demonstrates what the event is about it Halloween party that may be inclusive of trick or treating. The use of color in the graphics allows it to be the focal point of the design since the typographical elements are mostly set in a black color. As well as to note that the main typographical element also applies the use of colour to associate well with the graphics. 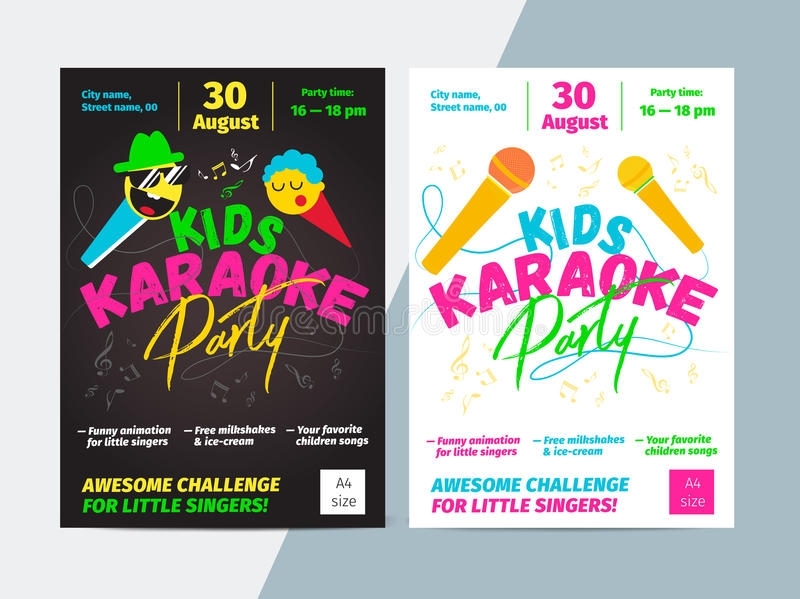 The second alternative is the Kid’s Karaoke Party Flyer Design | Royalty Free Vector. Let your kid’s talent shine through or polish a rough diamond in one of these karaoke parties. This specific flyer design is considerate with their placement of the technical elements. Setting the latter in a direct manner. This set comes along with two design and colour variations but the same overall layout for uniformity. 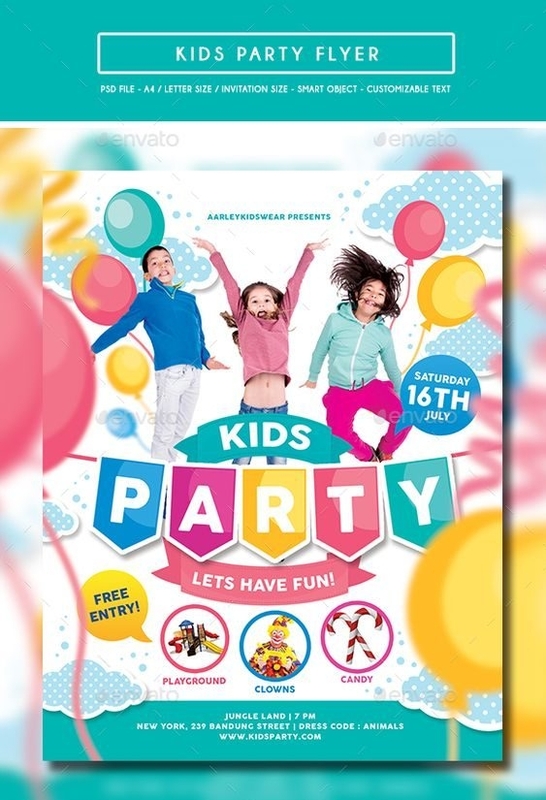 If you are looking for a kids party flyer design that is set in an outdoor setting, then the Kid’s Party Flyer Template PSD is a perfect design selection to consider. Balancing the dominant use of blue and white with the use of colorful balloons. As well as adding hand-drawn imagery to match the playfulness and outdoor setting of the flyer design. Don’t fret, the technical elements are placed on a quiet background to offer readability to the readers. If you are looking for flyer designs that are beyond the kid’s party theme, we have more offerings were glad to share with you. We have gathered Sports flyer designs that will be of great help, as well as the list, features a selection of flyer designs for various sports. We also listed yoga flyer designs that are perfect for promotional flyers for a yoga event, business, and service. If anything else, we have gathered these specific yoga flyer designs to be used as design references to inspire your creative eye. If you prefer to use simple graphics yet still demonstrates a playful side, the Delightful and Well-crafted Children’s Birthday Party Flyer is a great choice to consider. It uses a picture window layout allowing users to place the image of the celebrant as well as compliment such design element with cartoon graphics. Looking for party flyers dedicated for the Halloween event? Look no further. 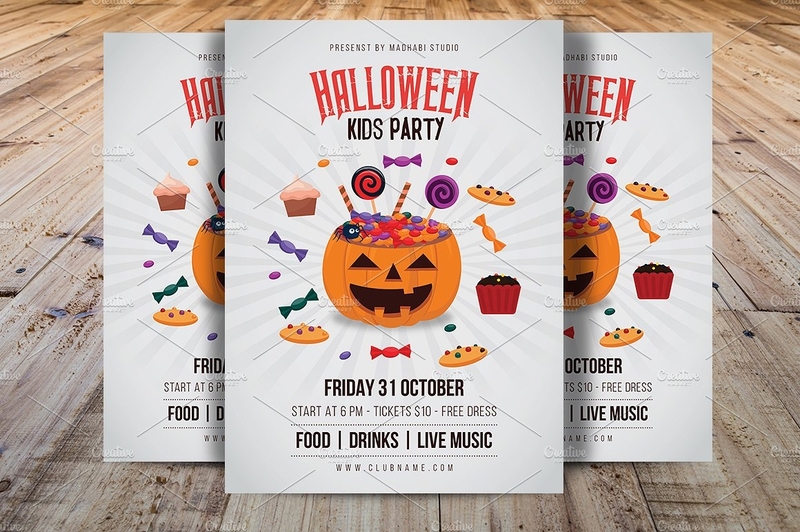 The Halloween Party for Kids Flyer Design uses well-known Halloween characters and offers an exciting appearance that is inviting for the younger demographic. This specific kids flyer design also comes along with a couple of design variations for en extensive selection. Next on our list is the Kid’s Party Flyer / Invitation Design offers a dynamic design and demonstrates a colourful and fun appearance with the use of colours as well as imagery. 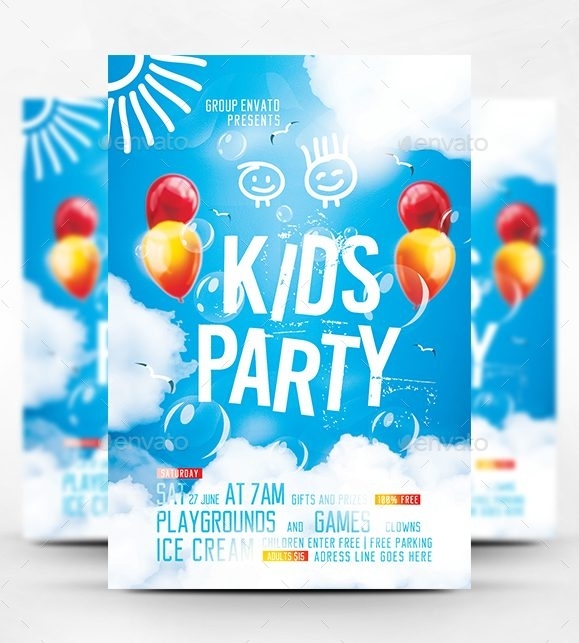 These types of kids party flyers are usually targeted to the adults which is why the layout used allows the viewers to skim through the content with proper direction to avoid confusion. 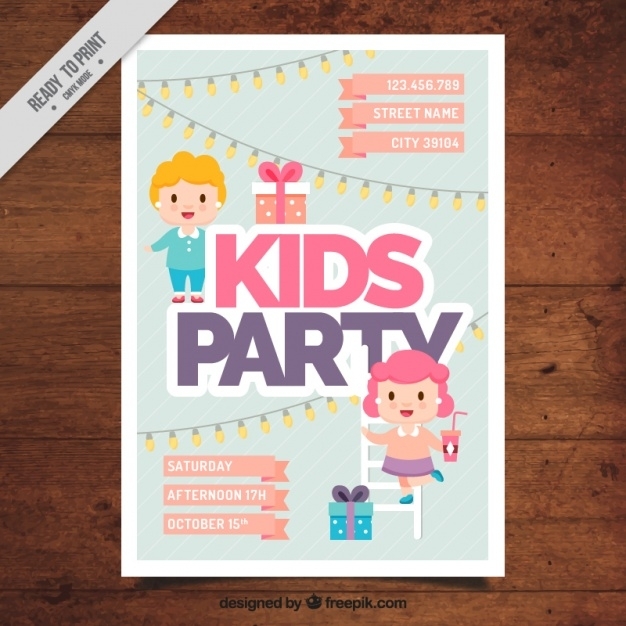 The Kids Party Flyer / Invitation in Flat Design executes a more subtle exterior for its design. The latter is set in a big type layout which is why the use of design elements is laid out in a way to set the event details; this is to give a proper direction for the viewers once they scan through the flyer. You may also go through our list of birthday party templates that will come in handy for parties, design projects as well for future design resources. Before we complete this list of kids flyer design, we have more offerings were glad to share with you. Flyers, as simple as it looks, the aforementioned goes through planning and design process to craft a high-impact flyer. To help you get by, we have prepared a guide on crafting a brilliant flyer which focuses on the general application of the latter. It is also inclusive of flyer design examples to inspire your creative eye.